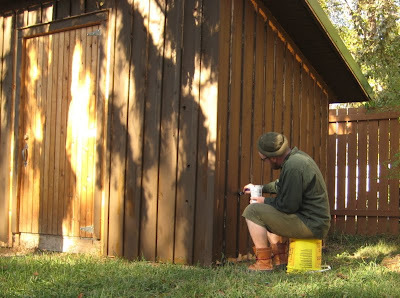 I’d say about a HALF of the painted stuff was painted in the last three and a half years – when I started getting really focused on projects and trying to STAY focused on them. Of course, as I mentioned earlier, this doesn’t even take into account the 15mm and 20mm stuff I still have… Oi!! So, if I didn’t buy ANY more toys… and continued to paint at the frenetic rate I’ve been going at all year… I could be finished all this in four years… Yeah… that’s going to happen (no, not really). Still I should really sit down and figure out some sort of plan or schedule or priority list to get a clear sense of when I'm going to get to what and work on shrinking the damn pile!! I should really go through all these again and really sort out what I definietely AM going to use at some point and get trade away some of the stuff that I KNOW I never will… like the 40 or so plastic Eldar (that I only just bought this year!?) – I ended up getting a pile of older metal ones (some from Cory, some from ebay) and the plastic ones are just junk by comparison… really, when am I ever going to get around to painting the 50+ cool ones… let alond do anything with those plastic ones!? 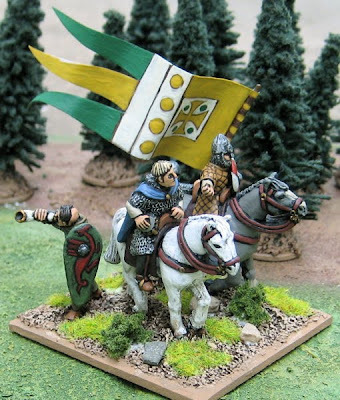 I finished up 12 Norman Knights (4 stands) earlier this evening, I just have to finish the basing details… pics should be up in teh next day or so – then it’s on to Anglo-Saxons/Danish!! I had hoped I’d be able to finish off the Norman Army this week, but two board meetings and a Halloween party are putting a serious cramp in my painting productivity… that and I’ve been doing a massive stock taking of all the 28mm miniatures I have to get an idea of how many I actually have and what percentage are actually painted!? More on that soon! 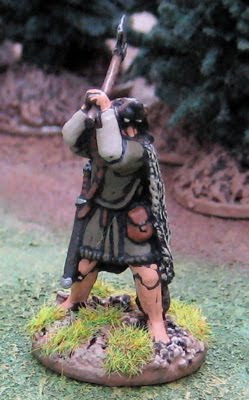 Hopefully I will finish up stock taking AND maybe finish up the Normans on Friday night... ? We shall see.. Unfortunately I just bought 40 new figures!? They're old AEG Clan War Samurai - similar to (if not the same as) the ones still being sold by Magnificent Ego for about $5US a piece - and I got the whole she-bang for just over $30US including shipping!? How could I pass that up! ?I should still be able to paint more than I've purchased this year..
A small number of the Grummsh remained in the area of Crudd. The Army of the Sapphic League marched there but were unable to pacify the area during the summer and would be caught up in a small guerilla war there at least until fall. When news of the fall of Marhan reached Jarl Thorvald Skardsen he immediately gave orders to give up the siege of Toctglenn and head back south! They marched south west to Cognomen to meet the fleet and sailed back for Marhan. Upon their arrival they found the city half in ruins and firmly under control of the orcs. They laid siege to it, but the orcs held on through the summer and could not be persuaded to give up the city. The Filed Army of Valishog had moved on and invested the capitol of Ludharn! King Claudius, his resolve stiffened by the news his general and the Field Army was on it’s way home, held on through the summer. Meanwhile, the Ilferien, having set up their administration in Praenomen, were back on the march. They headed back to Cognomen, then west to Wienglenn! There they called for the surrender of the fortress. Seeing the Elves as liberators, the Dwarves within murdered the Orc garrison and flung the doors open to welcome their esteemed guests! 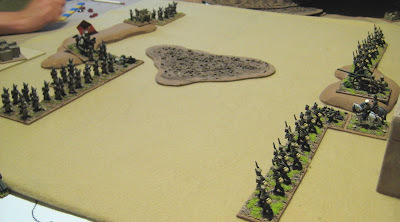 I FINALLY got cracking on some stuff for the Dark Ages DBA Campaign Weekend coming up in February! Some Normans! This will be the Knight General, perhaps Duc Guillaume le Bâtard himself. 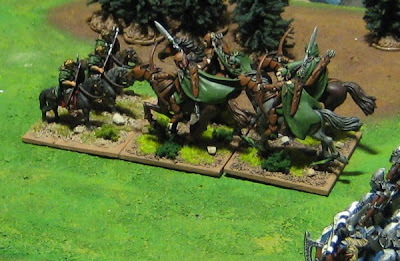 For a “Knight” stand, they don’t look all that damn… impetuous… Knights should be charging at a full gallop… Ah, well… The two mounted figures are from Crusader Miniatures, and the foot are from Gripping Beast. 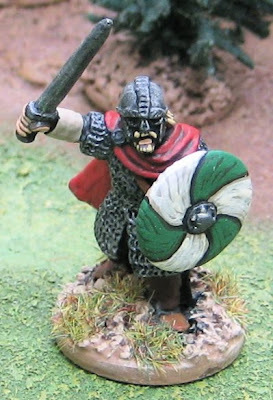 A single Saxon – another figure from Crusader miniatures. 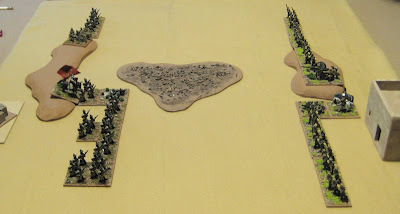 I got it in my head that I should make some “casualty markers” to show where stands were destroyed when I’m taking pictures for a battle report. 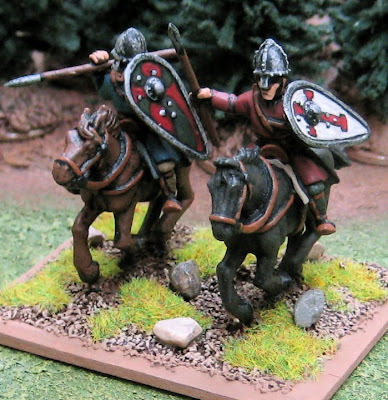 More Norman Knights to finish off the army! Well… now that the Back of Beyond Campaign is over with it is time to start work on the NEXT campaign weekend!! 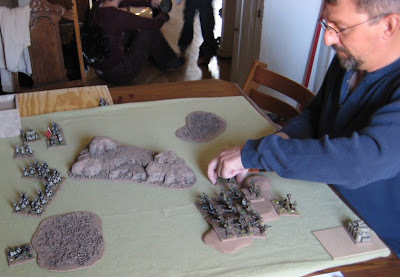 The next campaign weekend will likely be the weekend of the 26-27-28 February 2010 (Tim’s Sixth Annual Wargaming Birthday Bash). It will be set (mostly) in England, nominally around the end of the first millennium AD (give or take 66 years or so…). There will, at the very least, be Normans, Vikings, Anglo-Saxons or Anglo-Danish, Irish, and Scotts. 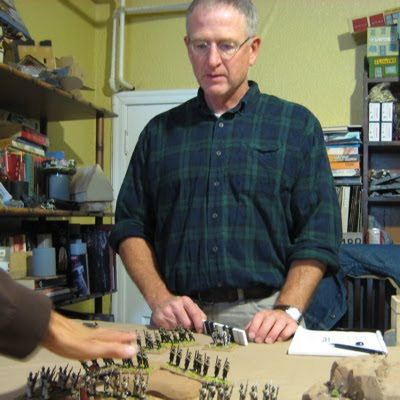 If I get a couple extra armies finished, and if CVT, Cory and Gary can be convinced to bring theirs out… well then we could potentially have up to THREE Anglo-Saxon/Danish players, two to three Vikings, Normans AND West Franks, Scotts AND Picts, Irish and Welsh… potentially up to twelve players…. (MWA-HA-HA-HA-HA-HA-HA-Ha-Ha-Ha-ha-ha-ha…. wait… do I even have that many friends…!?). Norse Irish in Ireland, Welsh in Wales. Picts in the North of Scotland (Highlands), Pre-feudal Scots in the south (Strathclyde, etc). The three Vikings would be Denmark, Scandinavia, and the Islands (Hebrides/Shetland/Orkney). The last two would be the Normans in Normandy and the West Franks in… well… the rest of France…? Maybe not entirely historically accurate... but damn wouldn't it be FUN!? TWELVE players!? Is this totally nuts…? 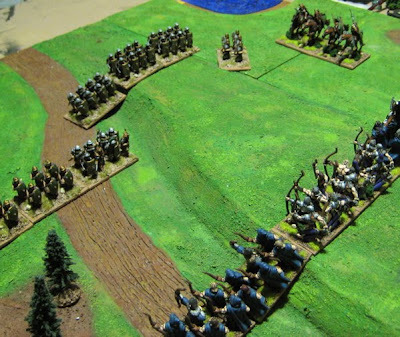 I decided last week to take stock of where I’m at and realized I have about 339 foot and 25 mounted to paint… That will finish off the Normans, Anglo-Saxons/Danish, Irish, Welsh, Scotts, Picts and a second Viking army…. With just under 20 weeks to go, that’s about 20 figures per week… Easy… so far this year I’ve been averaging 23. 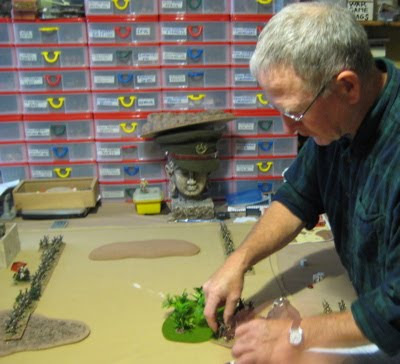 (I will do the second Viking army last – that’s 76 foot right there, if I don’t get it done it’s no big deal – I’ve already got one and Gary’s half finished his… a third would be fun… but… Anyway without them it drops the per week quota to 16). There is also a week Amanda has off in December and I could potentially get a lot done then. Going Berserk! Fun for boys AND GIRLS! 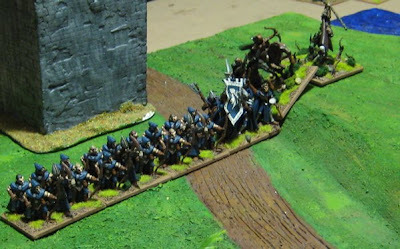 As mentioned in the previous painting update, here is another stand of Viking Berserkers. They are a mix of Old Glory and Gripping Beast. I now have three…. 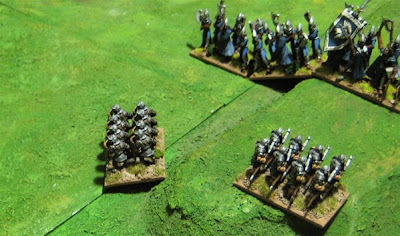 Unless I get around to a THIRD Viking DBA Army they won’t be of much use (other than in a Viking HOTT army – where I can have as many Warband as I want!!). I am curious to see what Warlords plastics are like. 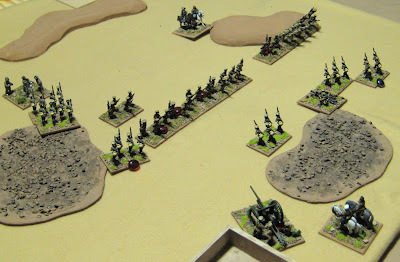 I was a bit underwhelmed by the quality of Wargames Factory'sColonial British Firing line... Warlord seems to be taking a better path - Rank and file plastics, supplemented by metal specialists, command, etc. 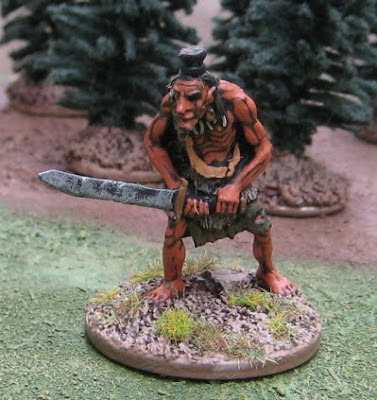 This is a Troll from Ral Partha… It’ll probably see use as an Oni in my Savage Worlds Oriental Adventure Campaign. Not newly painted but touched up and rebased – some more 18th Century British. 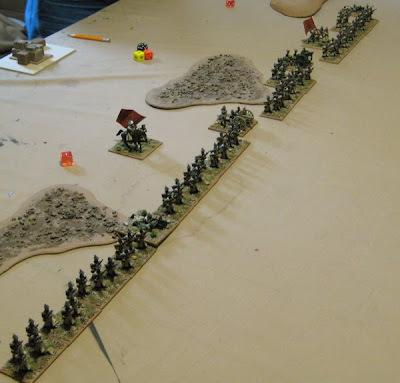 The Musketeers are figures from John, and the Officers are from Old Glory - thought I could call them either Light Horse General or Cavalry General… Two more stands and I’ll be able to play a battle. Starting in the south, The Orcs of Grummsh decided to take a slightly different approach to their campaigning. Despite their capitol being threatened by the Sapphic League they surged northward into the land of Ronarok, laying siege to Skohln. 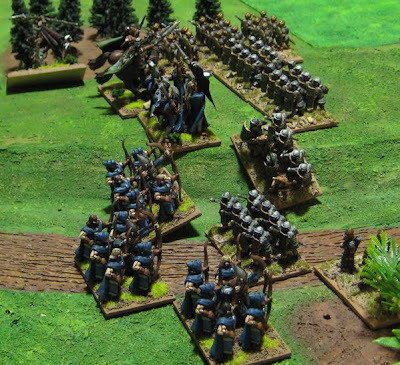 The Orcs of the south, while ferocious in battle, are not the most adept at siege works. The city was surrounded and assault after assault were thrown at the walls, each to be beaten back by the valiant defenders of Skohln. 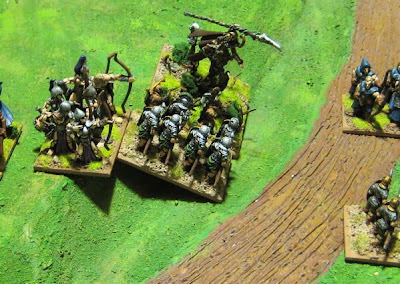 Eventually The Orcs just decided to camp out and starve the defenders out. Then ill tidings arrived from the south…. 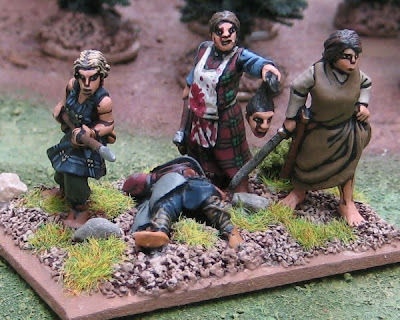 The Sapphic League marched on Marrow, expecting to find it defended by the Host of Grummsh. They were surprised to find the hillfort all but deserted. The walls were quickly stormed and the city sacked, many slaves were taken, and most of the rest were put to the sword. Would the Warriors or Grummsh accept The Sapphic League as their overlords or would they be wiped out of existence or driven from the lands of Kümer…? Further north the Ronarokings sailed from Marhan to Cognomen – a rough passage in the spring as the Tria Nominians can attest. A number of ships were lost in the crossing. Arriving in Cognomen they found the Elves already departed north and so marched east to Toctglenn. There they found the mountain fastness held by a small garrison or Orcs. Though the garrison small the mighty Dwarven fortress is darned near impregnable and the orcs could not be winkled out. The absence of the Orcs weighted heavy on Jarl Thorvald Skardsen's thoughts. “Where could they have gone?” he pondered. The answer arrived as a shocking dispatch from King Claudius; the Orcs of Valishog had stormed down from the mountains near Weinglenn and overrun the city of Marhan!! The Legions of Tria Nomina mustered in the spring and readied to march back to Cognomen in, yet another attempt to wrest if from the Elvish invaders. The Elves, it seems, were lighter of foot and caught the Tria Nominians as they just began their march south from Praenomen. The Legions of Tria Nominia marshal to defend the gates of Praenomen. The Elvish lines are drawn up for the attack. 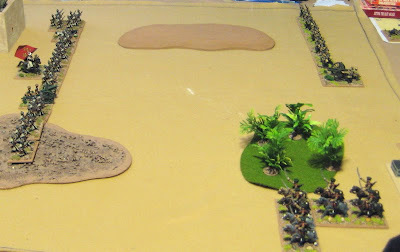 There was a brief cavalry skirmish on the flanks where the Tria Nominian auxiliary horse came to a bad end. With their flank threatened by the Elvish riders the Tria Nominians tried to redeploy. Then the first century in line was ridden down. 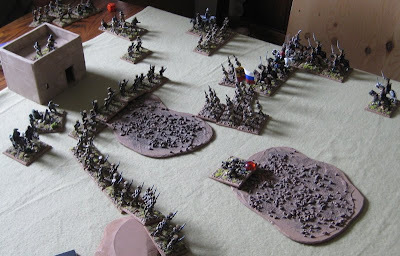 I t started to look like it might be a very short battle with the Elvish Cavalry taking all the glory. …and wiped out one squadron of them. There was some skirmishing of the main lines of foot. 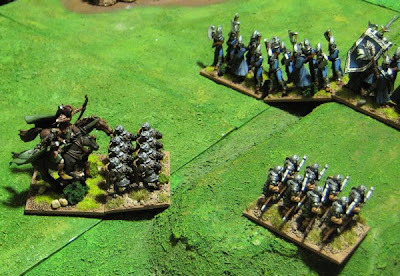 The Tria Nominians General drove two units of Elvish archers off the field of battle. It looked like the tide had turned…. But then the Tria Nominian General’s unit was surrounded and destroyed by the Elvish sorcerer while elvish archers blocked their escape. 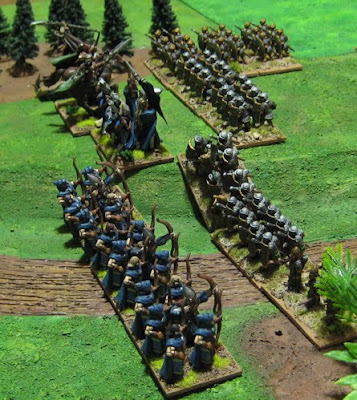 Eventually a unit of Auxilliary spearmen were driven from the field by the withering hail of deadly accurate Elvish archery. The Tria Nominians were forced to seek terms…. Country: Grummsh – Vassal of the Sapphic League? I finished up a fair chunk of stuff this last week. First of all... I finished up the shed! 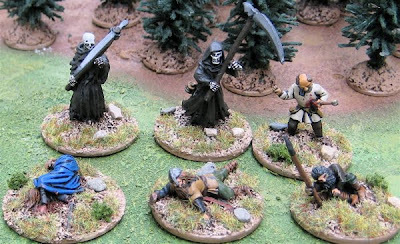 They will be used as Blade in a “Generic Medieval” Hordes of the Things army. They join three stands of Shooters (Archers). I have at least another three stands of Shooters (Crossbow, maybe more archers), and three more stands worth of Blades (halbardiers). I’ll probably split these up into the foot element of two separate armies. I haven’t painted a banner for the stand in the middle yet. I’ll have to decide on the names and backgrounds of the armies. 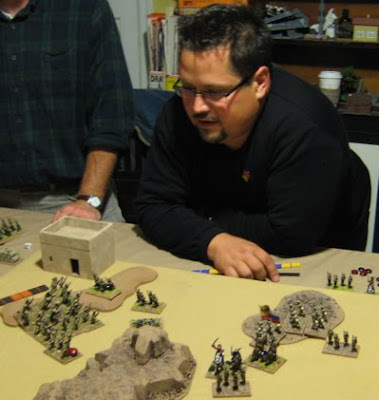 I may resurrect Duc Phillipe Lapin – a character I used when I played warhammer… goodness… 20 years ago!? Duc Phillipe’s coat of arms had lots of rabbits on them. If I did the second army as his nemesis – what would their coat of arms be…? Turtles…? Foxes…? 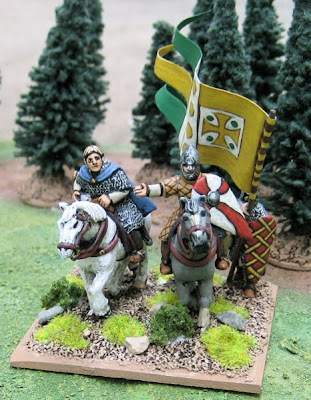 I have two or three old Bretonian Knights from Games Workshop and some old citadel mounted crossbowmen I could use as Riders… but I’ll need some more knights. 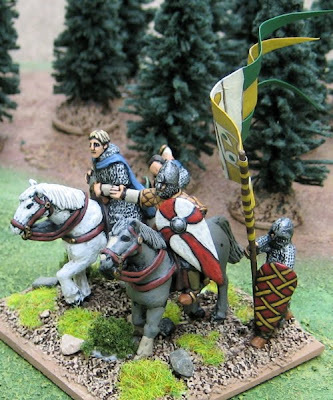 I’ve been eyeing up some of the Perry Miniatures Hundred Years War mounted men-at-arms to use as knights… Or perhaps just some more Old Glory… We’ll see. It’s not a big priority right now. 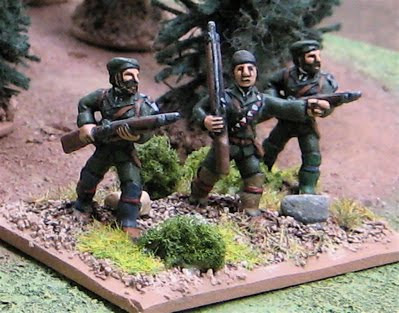 These are some Grenadiers made by my friend John Bertolini. As with most of his figures they are meant to be very generic. I’ve tried to paint them as “British”. 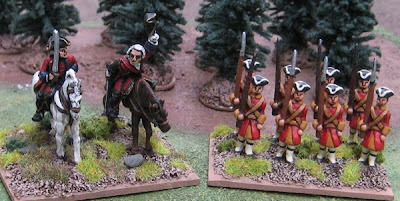 I actually started painting these figures… oh… eight years ago… but recently decided I really wanted to try out the DBA Extension for 18th Century battles. I have easily enough French, but need a few more stands of British. Two Guns and Crew and maybe a stand of Jägers should finish them up. This is a Keltos figure… I’ll use him with my Picts. 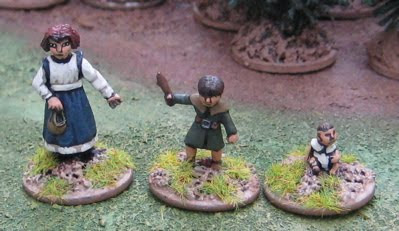 Some children from Reaper Miniatures. 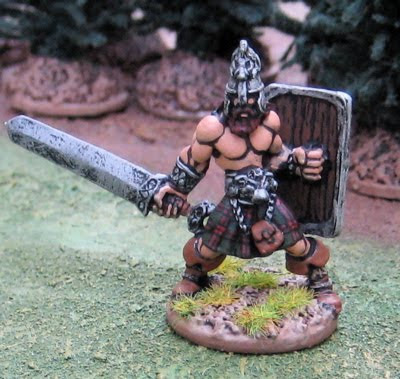 A Viking berserker/Ulfehdnar from Gripping Beast. 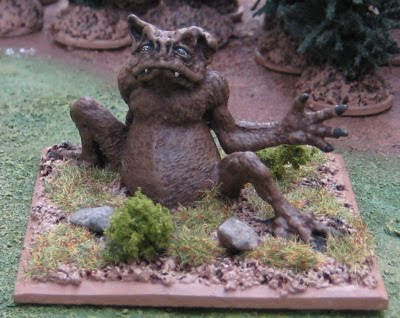 This is Tsathoggua a Great Old One from the Cthulhu Mythos. It’s an old Grenadier Miniatures Call of Cthulhu figure I’ve had for ages – recently stripped of paint and repainted and based to be used as a God in Hordes of the Things - should anyone ever want to play an army of Great Old One worshipping cultists…. I’m just finishing up the basing for a stand of Viking berserkers (Warband) – not something I really NEED (as I HAVE two already)… but at least it’s getting me on track with the Dark Ages stuff… Most of the stuff left on the workbench is Normans… I’m going to try and finish that army off in the next week or two. Then it’s on to the Irish! The Orcs were dealt a terrible blow last year but were not wiped out and have recovered some of their numbers…. These are some Light Horse for my Picts. I know one of the figures is from The Foundry. The other three I got in a trade. 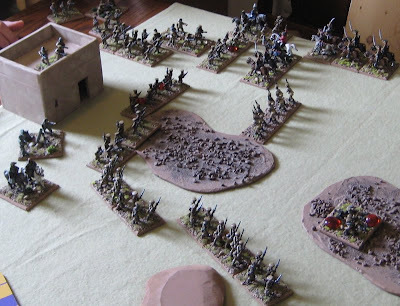 From the look of them I might have guessed Crusader Miniatures…? maybe...? but I can’t find them on their website… So probably not… Anyone know where they came from? 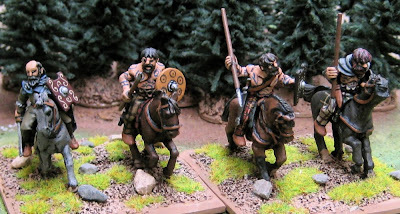 These Light Horse are for the Norman army. They are from Old Glory. 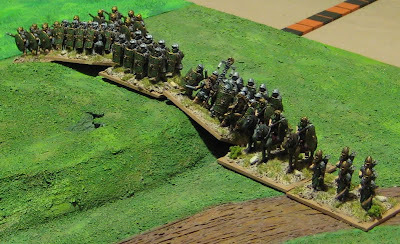 Last night I decided to take stock of where I’m at, in terms of what I need for the next Wargames Weekend (more on that shortly) and realized I have about 339 foot and 25 mounted to paint… That will finish off the Normans, Anglo-Saxons/Danish, Irish, Welsh, Scotts, Picts and a second Viking army…. With just under 20 weeks to go, that’s about 20 figures per week… Easy… so far this year I’ve been averaging 23. 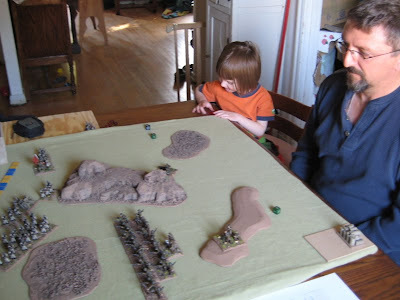 (I will do the second Viking army last – that’s 76 foot right there, if I don’t get it done it’s no big deal – I’ve already got one and Gary’s half finished his… a third would be fun… but… Anyway without them it drops the per week quota to 16). There is also a week Amanda has off in December and I could potentially get a lot done then. Despite the need to get it on with the Dark Ages stuff…. 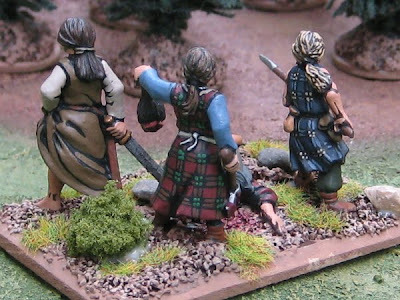 the next stuff up will be three stands of generic medieval axe-wielding Blade (for a Generic Medieval HOTT Army) and a couple stands of 18th Century Grenadiers…? The figures are painted; I just have to finish basing them. 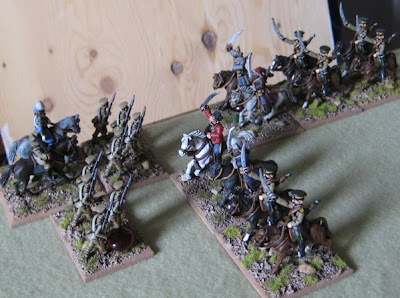 After that… well… there are some 18th Century light infantry, artillery and crews still on the work bench (Two Cannon and one Jäger will finish up an army of British – then I can try the DBA extension for the Horse and Musket era – although, admittedly, I don’t actually have very many “horse”… ). 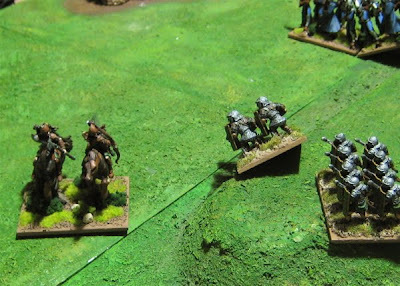 After THAT there are more Vikings and Normans ready to roll right off (and some Descent minis…). Now the Army of Grummsh could be totally mounted!!! 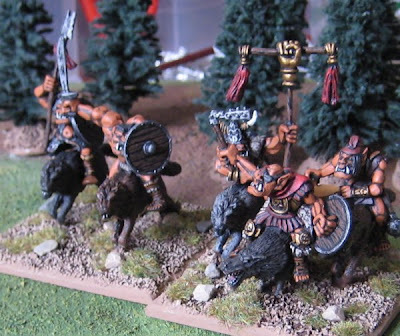 These are Ghost Miniatures Orc Wolf Riders from Old Glory. I swapped out a number of the wolves and mixed in some wolves from West Wind Productions Gothic Horror line for some variety. 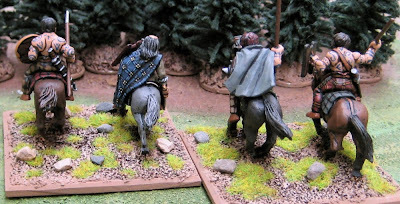 I have both Pictish and Norman light horse finished – just finishing up the basing. 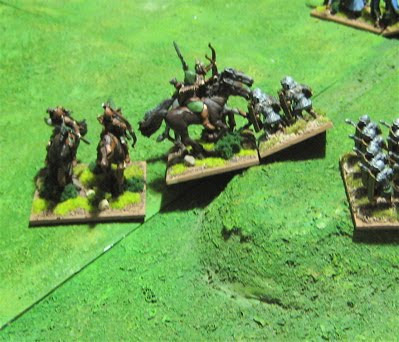 The workbench is still populated mostly with Norman Cavalry… but there’s also some medieval axemen, some Seven Years War infantry and artillery crews, some Viking berserkers, and a couple Descent minis have made it back on the table…. Maybe this time I’ll damn well FINISH THEM!!! 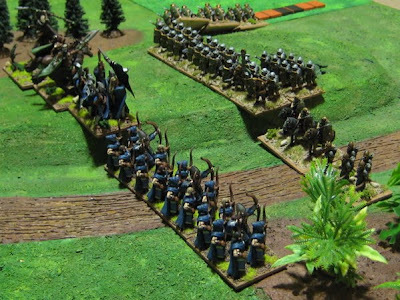 The Scouts of Vlad the kinslayer headed south before the army. Their hunch was, after the news of the Ilfeiriens defeat at Praenomen arrived, that the Ronarokings would give up the siege at Toctglenn and return to Cognomen, and possibly march on Praenomen again. They found Toctglenn no longer besieged and reoccupied the mountain stronghold. The legions of Tria Nomina, meanwhile, pursued the Ilferien back to Cognomen. They were disheartened to hear the Ronarokings had given up their siege and returned to the port city. The Second Battle of Cognomen. 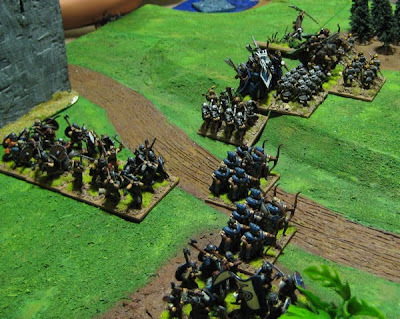 The much reduced Elves march out to defend the city of Cognomen. 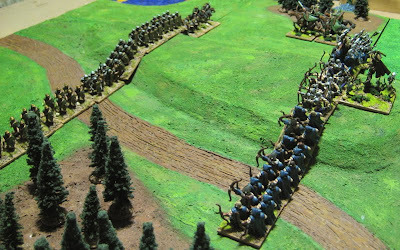 There was much shoving back and forth – though the Tria Nominian cavalry was driven from the field in a hail of Elvish Arrows. … and things got pretty confused for a bit. A legion was forced to retire and things started looking bad for the Tria nominians. 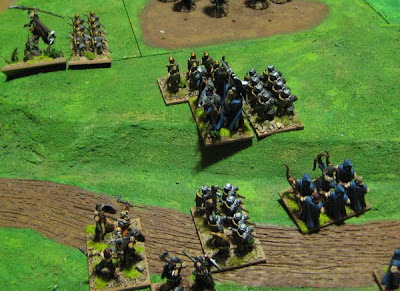 Then the Elvish cavalry was driven from the field, and their General threatened! The Ronarokings surrounded the Tria Nominian Generel, but were beaten off - not once but THREE TIMES! The third time the Ronaroking Berserks left the field! Then it was the Elvish General that was once again threatened… the Elvish mages driven from the field… Everything hung in the balance! 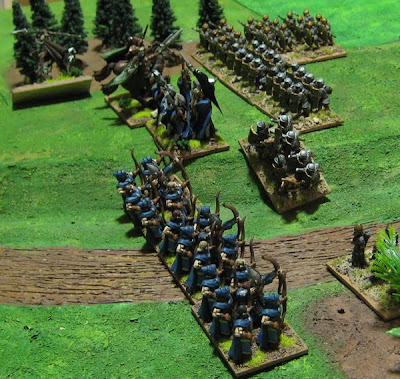 The Elf Generals body guard threw off their assailants and charged down after the legion – which was also flanked by archers and driven from the field… this was too much for the Legions of Tria Nominia and the remaining legions retired from the field of battle and back to their capitol of Praenomen…. 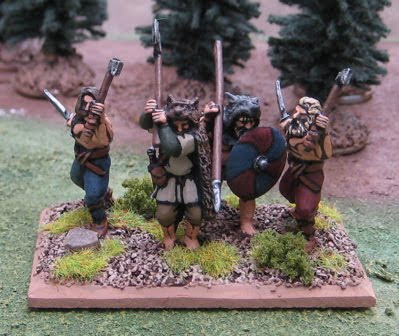 These are some Viking Archers from Gripping Beast. 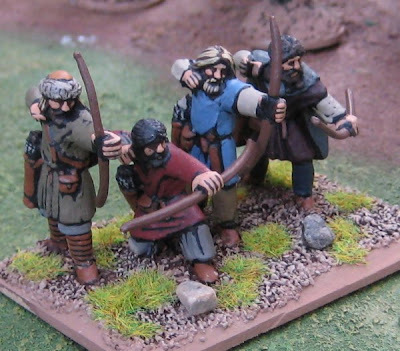 They’ll be replacing some Welsh Stand-ins as the optional Bow element in my Viking DBA Army. 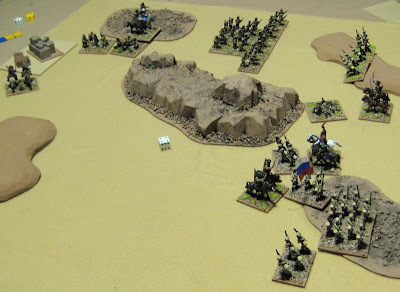 This past weekend I ran a campaign set in the “Back of Beyond” – nominally during the Russian Civil War in Central Asia. We used a modified version of DBA (mostly based on the DBA 1500-1900 Extension with a few tweaks of our own…). We took some liberties with the forces and setting for a variety of reasons (available figures, ease of play, etc.). The Forces involved were two Nominally White Russian/Tasrist forces; the 3rd Siberian Guards Division Commanded by General Bertolovski and the Central Asian Cavalry Division commander by Baron Roman Christof Maximillian Von Ungern-Tighem. Nominally supporting them was the Canadian Central Asian Expeditionary force commnded by Brigadier Biggles-Smythe, who has pushed their way up the rail line from Vladivostok. Opposing them were two forces of Bolsheviks; The Red October Division Commanded by General Strelnikov and the 4th Shock Army commanded by Comrade Commissar C.I. Knudsoloffskivichstein. Just across the border in china were territories commanded by two warlords; General Sun Jak-Shen commander of the “White Tiger” Division and Luong Wei-Roun commander of the Tang Ti Brigade. 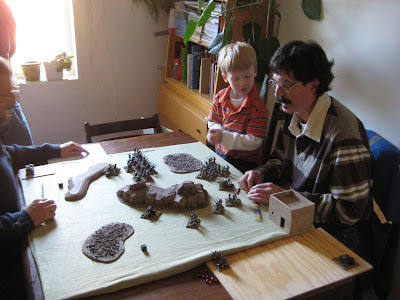 You can find the rules we used for the campaign HERE. 3rd Siberian Guards Division, marching south from Baoushka, at Vlodkask. There they met the Bolshevik the 4th Shock Army. There were a few minor skirmishes between out riders but Comrade Commissar C.I. Knudsoloffskivichstein, despite his fervent dedication to the cause, was a bit of a realist and retired his force back to Engelsk. Further to the south The Red October Division marched on Tashkabad and laid siege to the walled city. The Emir of Tashkabad had decided to capitalize on the chaos and declared the city independent when the fighting broke out . The city held through the summer. 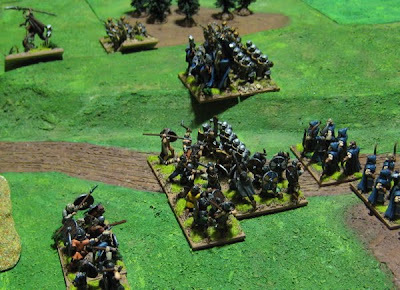 The Forces of Ungern-Tighem face the “Yellow Tiger” Brigade – hoping to smash through them before their allies can be brought up. 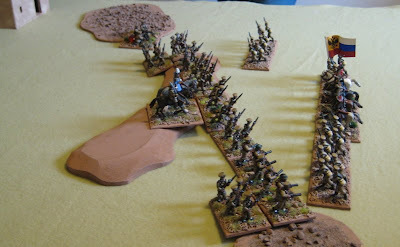 The Cavalry clashed with the left of the Chinese line. In the melee Von Ungern-Tighem was knocked off his horse. 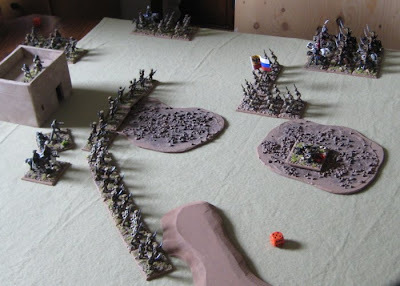 Rumours quickly spread that their general had been killed Chaos and confusion ensued and quickly turned into a route! Further north The Tsarist and the Canadians split their forces; the Siberian Guards Division pursued the 4th Shock Army to Engelsk while the Canadians marched south to lift the siege at Tashkabad. Comrade Commissar C.I. 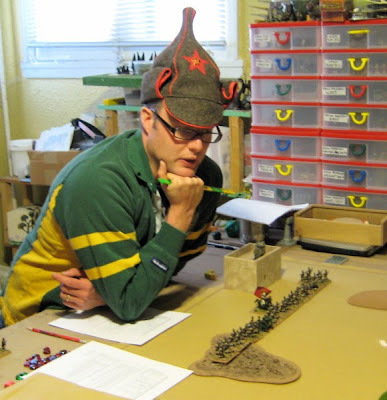 Knudsoloffskivichstein marshals his forces to defend the city of Engelsk. General Bertovski leads his forces into battle. In the end he Bolsheviks were forced to retire and give up Engelsk. 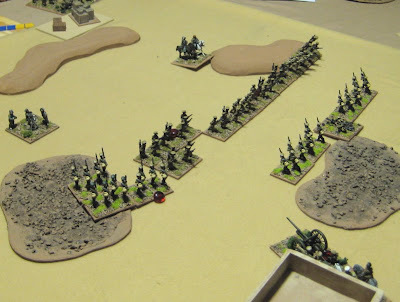 Brigadier Biggles-Smythe marches his forces towards Tashkabad! 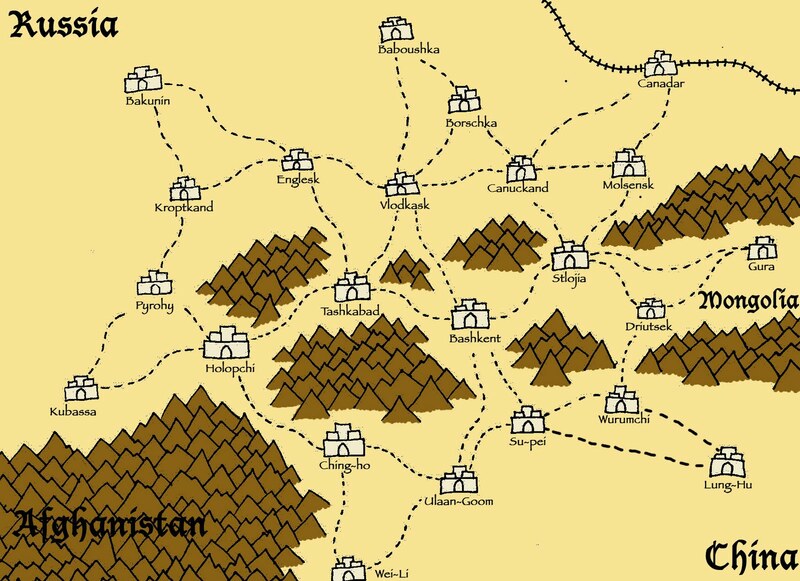 After a week of drunken debauchery General von Ungern-Tighem stumbled from his yurt outside of Driutsek to find the Chinese armies had followed him up into the mountains and had already surrounded the city! To avoid another disaster Von Ungern-Tighem retired his forces to hid “capitol” of Gura and the Chinese invested the city. Driutsek held on, however, and the Chinese were obliged to retire back through the mountains into China for the winter. 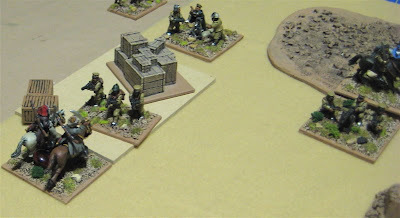 The Red October Division rallied at Holopchi and decided to return to Tashkabad. There, however, they found that the 3rd Siberian Guards Division had joined the Canadian Expeditionary Force and decided discretion was the better part of valour and retired back to Holopchi for the winter. The 4th Shock Army returned to Engelsk and besieged the city, but the Tsarist garrison held on and Knudsoloffskivichstein’s forces retired to Bakunin for the winter. 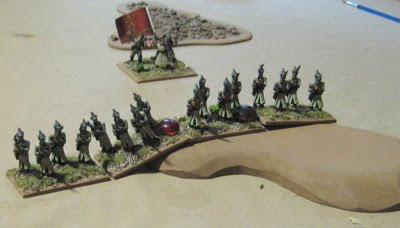 After a winter of debauchery in Gura, von Ungern-Tighem had worked up a powerful thrist for blood and led his Central Asian Cavalry division back into China! 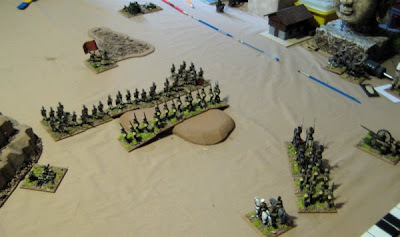 Despite news of the immanent arrival of the “White Tiger” Division, von Ungern-Tighems forces were once again drawn up and readied to fight the Chinese! 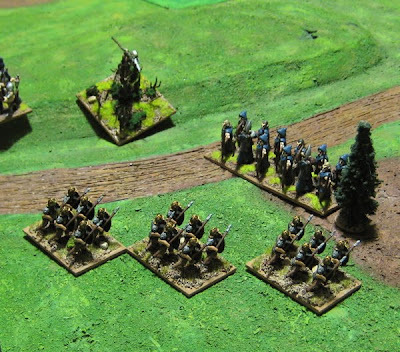 Von Ungern-Tighem draws up his forces and sets off towards the “Yellow Tiger” Brigade who were arrayed to defend the city of Wurumchi. Unfortunately, due to poor communication and possibly a terrible hangover, von Ungern-Tighems forces are still maneuvering when the lead elements of the “White Tiger” Division arrives! 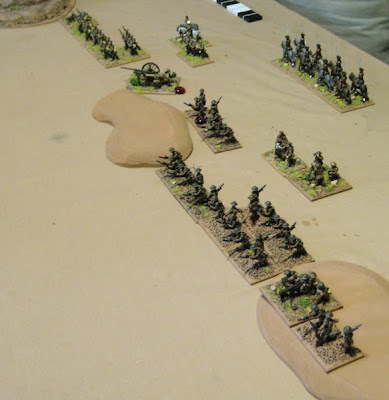 The cavalry charges into the fray!! Surrounded on all sides by the yellow horde an attack looked a bit like suicide. Von Ungern-Tighem, leading from the front, fought furiously! 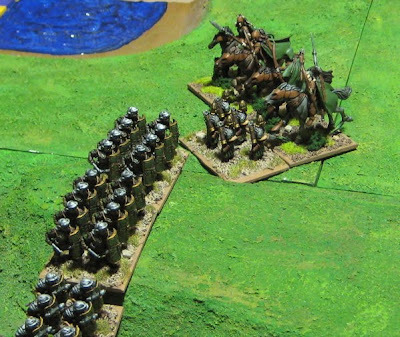 Despite the ferocity of their commander, it was an absolute slaughter… The Central Asian Cavalry Division limped back across the border having lost nearly half their number…! 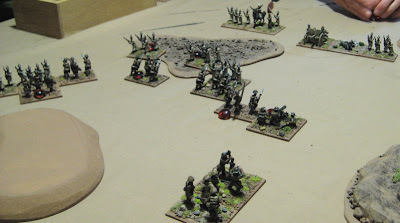 Meanwhile, further to the North and East the combined forces of the Red October Division and the 4th Shock Army faced off against the 3rd Siberian Guards Division and the Canadian Expeditionary force at Engelsk. Comrade Commissar C.I. Knudsoloffskivichstein and General Strelnikov marshal their forces outside Engelsk. If it weren’t for the steady Canadians hammering of the 4th Shock Army the battle would have been an utter disaster for the Tsarist forces… still they were obliged to give up Engelsk. The Canadians retired to Tashkent and the Siberian Guards Division retired to Vlodkask. After his staggering defeat in the spring, Von Ungern-Tighem spent much of the summer was spent avoiding battles and licking wounds. The Tang Ti Brigade of General Luong Wei-Roun pursued Von Ungern-Tighem to Driutsk. The Central Asian Cavalry Division was in no shape to risk another field battle so they continued on to Stlojia, leaving Luong Wei-Roun’s forces to besiege Driutsk. The Tsarist forces fought a desperate battle against the Red October Division on a hill Northwest of the city. 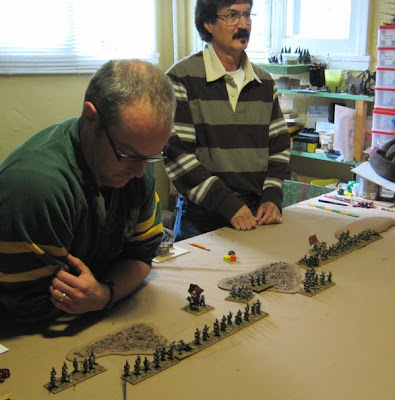 The Canadian Expeditionary Force met the 4th Shock Army to the Southwest. Brigadier Biggles-Smythe contemplates his options. 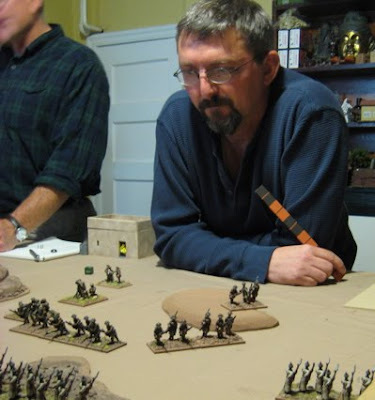 General Bertolovski watches as time and again the Bolsheviks try to wrest his troops off of the hill. The forces of Imperialism are once again defested by the Bolsheviks and retired back to Vlodkask. The Bolsheviks maintained the momentum of their advance and followed the Tsarists and Canadians to Vlodkask. The Tsarists and Canadians were much too depleted to give battle there and so the 3rd Siberian Guards Division continued on to Baboushka where they would winter and refit, while the Canadians returned to Canackand to receive reinforcement drafts from home. The Bolsheviks besieged Vlodkask, but were unable to take it before winter set in and they were forced to retire to winter quarters. 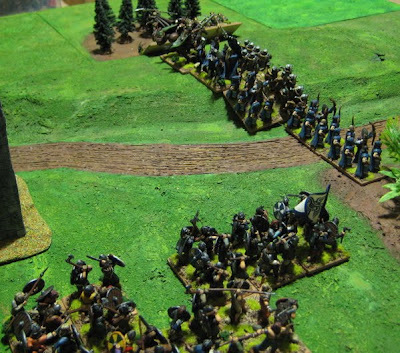 The Tang-ti Brigade continued its siege of Driutsek with little success. The city held and the army retreated to Wurumchi for the winter. 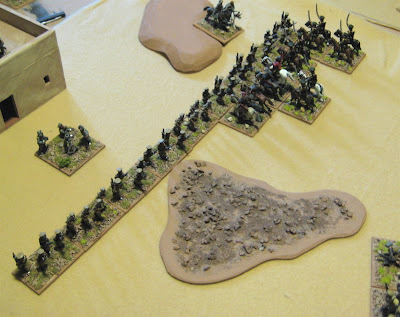 The Chinese mount the hill and pour fire down on The Army of Ungern-TIghem who were stlled by… well... I’m not sure why they were still standing there… Ill advice from international advisors…? 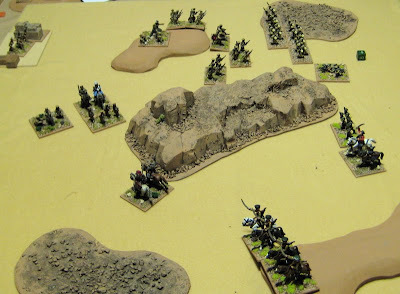 Once again the Tang-Ti Brigade marched north into the mountains to Driutsek, and once again fled from the terror that was the Central Asian Cavalry Division – the personal army of Baron von Ungern-Tighem – without even fighting…. 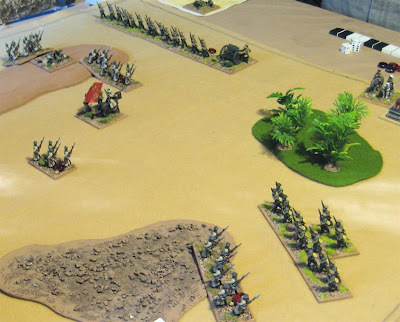 Luckily the mighty General Sun Jak-shen had advanced to meet General Luong in Wurumchi, and the presence of the White Tiger Divison kept the retreat from turning into a rout!! The Canadians, this year marched south to Driutsek to meet up with von Ungern-Tighem’s Forces, while the 3rd Siberian Guards Division stationed itself in Vlodkask to stall the advance of the Bolsheviks. 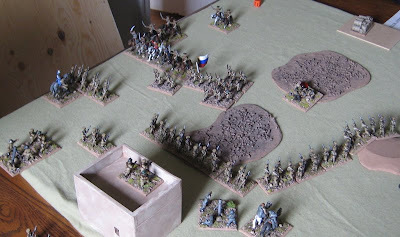 When combined strength of the Red October Division and 4th Shock Army arrived the Tsarists once again retreated to Baboushka, leaving the Bolsheviks to besiege Vlodkask. The city was weary of siege, remembering the trials and hardships of the previous year and fell to the Bolshevik forces only a few weeks later. The Tang Ti Brigade, now backed up by the White Tiger Division again marched up to Driutsek only to find the Canadians and the Army of von Ungern-Tighem had vacated leaving only a small garrison that held on through most of the summer, but eventually surrendered the city to the. The Army of von Ungern –Tighem had, in fact, marched west with the Canadians to Bashkent. The Central Asian Cavalry Division stormed the city before they even knew they were under attack. Von Unger-Tighem’s troops sacked the city before moving on. All the Chinese prisoners taken were crucified along the road as the Division pressed on to the south! 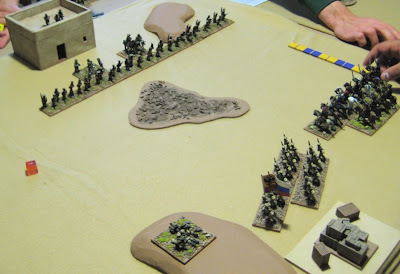 The Bolshevik 4th Shock Army marches on the Tsarist Stronghold of Baboushka. It was a hard fought battle but eventually the Tsarists were overcome and the city from the tyranny and oppression of the imperialists and introduced to a whole new kind of tyranny and oppression! That’s right, Genral Sun Jak-shen must have thrown a hissy-fit, or something, at Luong Wei-Roun for letting him get cut off and so they met on a “ceremonial” field of battle General Luong Wei-Roun (or perhaps one of his aides dressed dressed in his uniform) rode forth to be shot down by a literal firing squad, thus “losing a battle” and Sui-Pei along with it to the White Tiger Division thus giving them a place to retreat to for the winter and not be knocked out of the game… conveniently all stands lost were recovered in the Winter…. Huzzah for clever manipulation of the rules! I didn’t even get a picture of it. 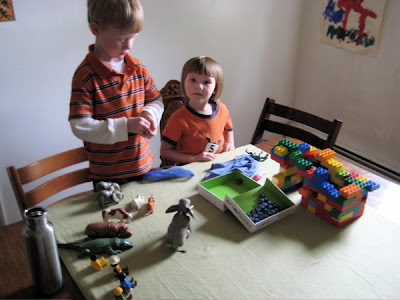 They claim the set it up and played it out while I was out of the room… It was THAT quick!! There was some pretty fancy dancing in the spring of 1921…. The Tsarist 3rd Siberian Guards Division took Vlodkask, and the 4th Shock Army took Canuckand…!? Further south the Tang Ti Brigade marched from Wurumchi to Sui Pei and then north to Bashkent and invested it, only narrowly missing the Army of Unger-Tighem, which had wintered in Stlojia and headed for Ulan-Goom in the spring. The garrison more fearful of the Wrath of the Baron von Ungern-Tighem held on against all odds! In Ulan Goom von Ungern-Tighem met with Sun Jak-Shen and his White Tiger Division. 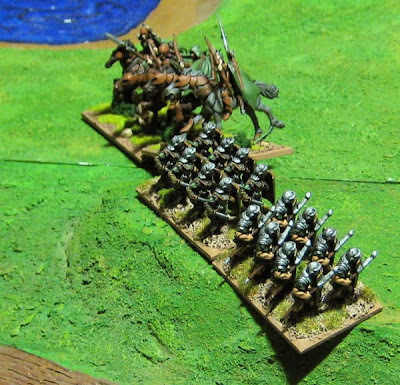 Relentlesly mocked by all players in the campaign so far, von Ungern-Tighem unleashed his Mongol cavalrymen. The swept north around the mountain that looked over the city of Ulan Goom and successfully outflanked the pickets of the White Tiger Division. The Dance of the Tsarists and Bolsheviks continued… The Canadians marched north to Baboushka and south again to Canuckand. There they laid siege to the city that had once been under their control, but were unable to wrest it from the Bolshevik garrison within. The battle was hard fought, but eventually the Tsarists were obliged to retire. As news had arrived that two Bolshevik forces were in Vlodkask, General Bertelovski chose to lead his troops to Stlojia. In the South the Army of Baron von Ungern-Tighem stormed the city of Wei-Li while The White Tiger Division returned to Ulan Goom to take it back by siege. Most died in a hail of machine-gun fire. The Army was broken and routed, but, being completely cut off most were massacred as they tried to run. The Baron von Ungern-Tighem himself was severely wounded and captured. He was executed a couple days later in Wei-Li and left to rot in a ditch outside the city on the edge of the desert. Congratulations to Jackson (Sun Jak-Shen) and his White Tiger Division for his hard fought victory (we didn’t just let you win because it was your birthday…)! Once again Rick was robbed of overall victory due to clever manipulation of the Campaign Rules… but at least this time it was his own doing (so I don't feel so bad...)!! Thanks to John and Gary and Rick and Jackson and Christian – and especially to Terry and CVT who drove all the way from Edmonton! Despite my utter exhaustion at the end of it all it was a pretty darn good time… I guess the players were having a good enough time too, as they totally skipped having lunch and raged on with the campaign instead!? What to do about Thrud...?